Detroit must overcome its sprawling landscape and its prime benefactor: the automobile, to revive the economy and become an environmentally sustainable 21st Century city. Check out our latest on the Detroit Future City proposal. Beautiful, maligned Detroit, Michigan. Its lake-front charms disabused by decrepitude. Expressways stream into the distance under hazy sunshine. Its grassy knolls expanding from demolished river-side working class enclaves, a victim of corporate and municipal mismanagement and resulting racial polarization. Yet, the breeze off Lake St. Clair smells sweet for some reason. The term “urban prairie” denotes vast tracts of formerly urbanized land returning to nature. The metropolis, an erstwhile symbol of US industrial might, transformed by design into the sterile automobile-sprawl spreading far into the ever-populated-strip-mall-hinterlands, has left the central city depopulated. The deserted shattered-window 1912 Beaux Arts Classical train station looms over Corktown grasslands like a staggering rhino dying of starvation, a casualty of wrong place, wrong time. The city once had 300 miles of electric streetcar lines running along its system of boulevards and streets, with a bustling downtown with three department stores, Kern’s, Crowley’s, and Hudson’s. We must raise the train and its station from its ashes, bringing the shoppers with it. The complex, multifaceted solution to this economic senescence requires rediscovering multi-modal transportation that could reconnect the suburban-beyond to a reinvented walkable downtown. Open fields surround with room for wandering among the pheasants, growing food permaculture-style, and potenial for expanding this urban village experiment with new affordable and safe housing and shopping. 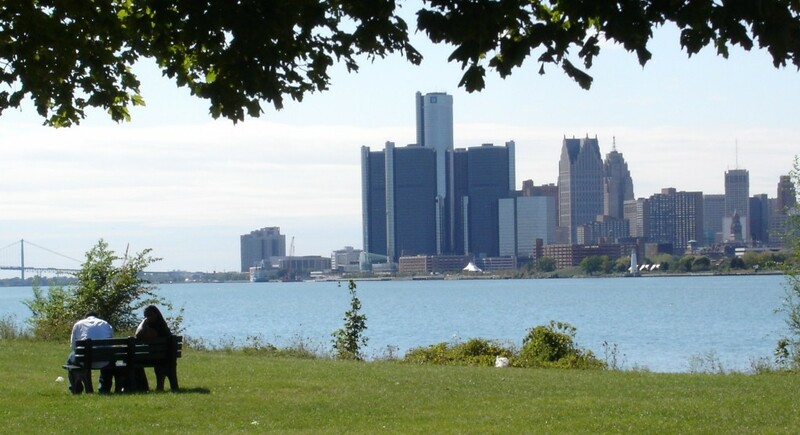 A view of the Renaissance Center across the Detroit River from Belle Isle. Ste Anne de Detroit Church – with records dating to 1704, the second oldest continuous Roman Catholic Parish in the US. The Gothic Revival structure here dates to 1886. Long disappeared indigenous “Mound Builders” once inhabited the Lakeplain Wet-mesic Prairie of Jack Pine, blueberry and chokecherry. The European impact has been slower to disintegrate, however. In the 1600s, Antoine de la Mothe Cadillac saw le détroit, “the straits” between Lake St. Clair and Erie, as an obvious French military post, where they could defend against the British moving west out of New England. In 1701, Cadillac established a settlement called Fort Ponchartrain du Détroit, including relocating Ottawa and Ouendot People (Wyandot or Huron), who had been warring with the eastern Iroquois, and had allied with the French in missions. The first building completed was Ste Anne’s Catholic Church. The French slipped in power after the Fox (Meskwaki) Indian Massacre at Windmill Point and losing the French and Indian War in the mid-1700s, when Fort Detroit came under British rule. Later, the British deflected Ottawa Chief Pontiac’s Rebellion, but signed over the Fort to US control years after losing the Revolutionary War in 1796. Woodward’s Hub and Spoke Plan Based on LEnfant’s DC Prototype, The first renaissance when Detroit raised from the ashes of the 1805 fire. After the great fire of 1805, Judge Augustus B. Woodward along with Michigan Territory Governor William Hull, planned the city of Detroit. They adopted the model of Pierre Charles L’Enfant’s Washington D.C. design of a central hub (Grand Circus and Campus Martius Parks) with radiating spoke-like broad avenues (Woodward, Michigan, Grand River, Gratiot, and Jefferson). Though quickly abandoned, the plan called for the first radiating avenues that would eventually allow much of the city’s population to escape the growing industrial miasma of the central city into the leafy suburbs and beyond. The city motto, Speramus Meliora, Resurgit Cineribus, “We hope for better days, it will rise again from the ashes,” continues inspire a further renaissance from the follies of the past. A growing transportation hub, Detroit’s Gilded Age arrived in the late 19th and early 20th Century, once known as the “Paris of the West” for its architecure on the recently electrified Washington Boulevard. Henry Ford built his first automobile (“horseless carriage”) in a shop on Mack Avenue in 1896, and the Dodge Brothers, GM’s Billy Durant, and Walter Chrysler established the city as the Motor-City. The metropolitan area expanded on wheels, adding tens of thousands of new arrivals, both whites and blacks from the rural South as well as European immigrants like my grandparents from Sicily. Mexican artist Diego Rivera illustrated the labor struggles as well as the city’s economic pre-eminence in his “Detroit Industry” murals in 1932. As well, job and housing discrimination against African Americans led to the 1943 and 1967 Race Riots. And finally, Europe and Japan began to produce sleeker, more efficient, and more reliable automobiles, cutting into local manufacturing, and the Detroit auto industry went into a long-standing contraction, losing hundreds of thousands of jobs. 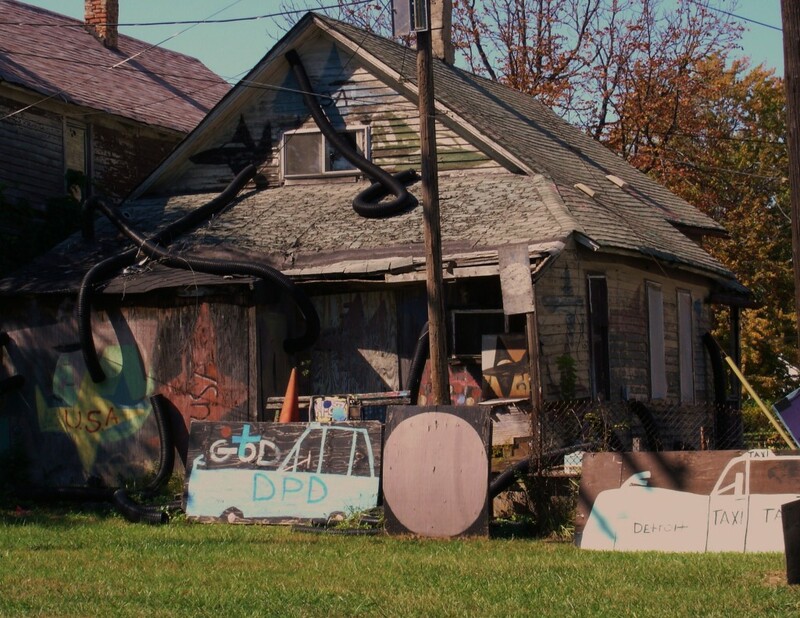 The Heidelberg Project allowed Artist Tyree Guyton free reign to recreate a decrepit street amid the Urban Prairie. Hence, Detroit’s industry and social organization began to fray, leading to today’s economic, environmental and social problems limiting the city’s long-term sustainability. So, where do we go from here? How do we retrofit automobile-oriented sprawl? What should we do with the deserted grasslands? Is there a right-size for legacy cities such as Detroit?